An exclusive insight into a young woman of dance in Kyoto. As a curious writer, I confess to having an inexplicable interest in Geishas. At long last, the old adage “all thoughts turn into reality” rings true. A week before visiting Japan, I came into contact with a business associate. Her friend puts me in touch with a Maiko. 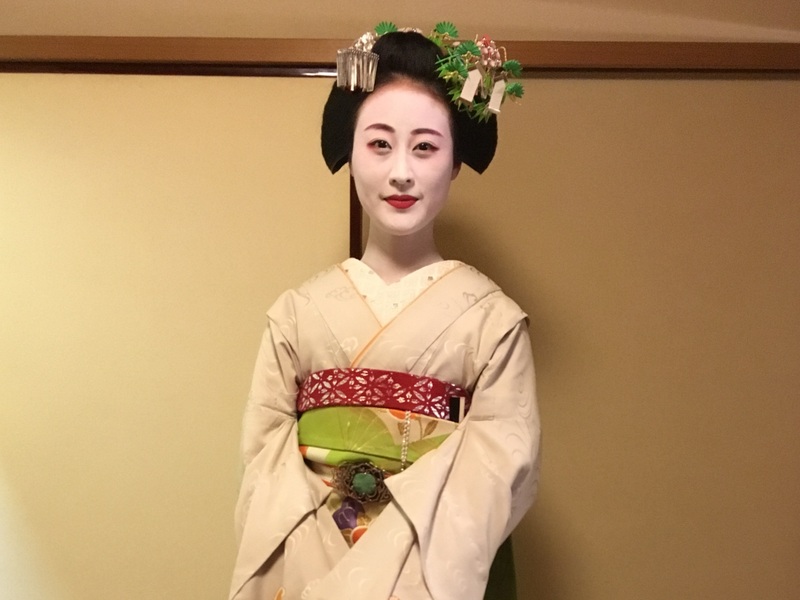 Here is my story: meeting a young woman of dance in Kyoto. Dusk falls. This is a once in a lifetime opportunity. Kyoto, the former capital city of Japan, is home to a beauty-obsessed elite. It is the only place for Maikos to train and become Geishas. Everything old becomes new again in Kyoto. A living historical city, buildings steeped in tradition withstand the test of time. The main Kamo river flows through the city centre. A natural medley of oriental willow trees line Shinto shrines. 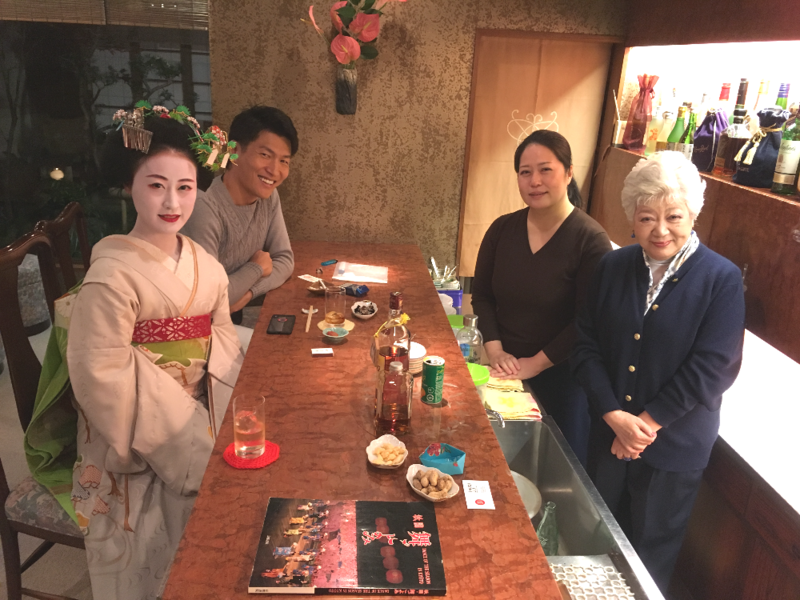 Noriyuki, my local guide, takes me to an Ochaya, a teahouse establishment where patrons are entertained by Geisha. 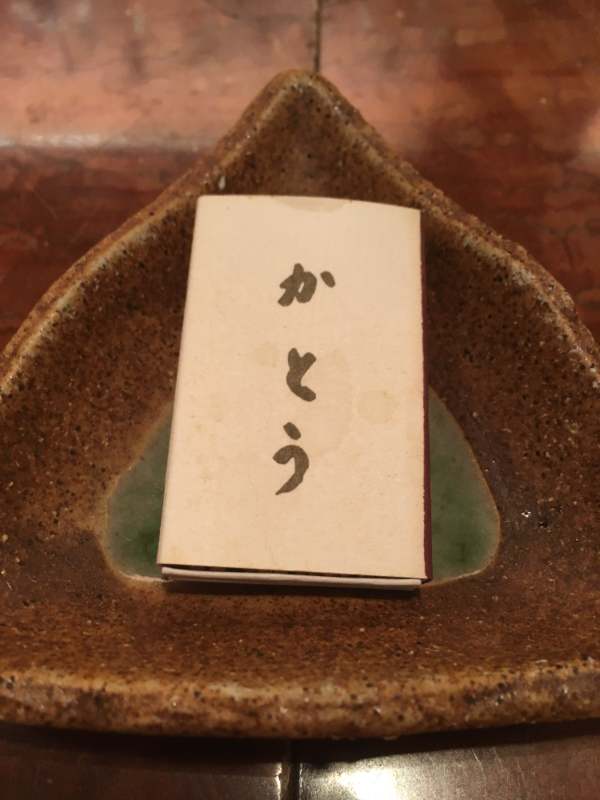 Born in Kyoto, Noriyuki is a businessman. Obsessed with fast cars and gourmet cookouts, he gains riches by running a chain of centrally located massage parlours in Osaka, Kyoto and Tokyo. Noriyuki (top left), is a businessman in Kyoto. He brings me to an Ochaya to meet Maiko. First, we are greeted by Okaasan, the lady boss of the Ochaya, and her assistant. Typically, an Ochaya caters to a discreet clientele with expensive taste. One can only enter accompanied by an existing patron, with reservations. Yet, the teahouse is modestly decorated, a wonderful respite from trendy places that vie for social media’s attention. 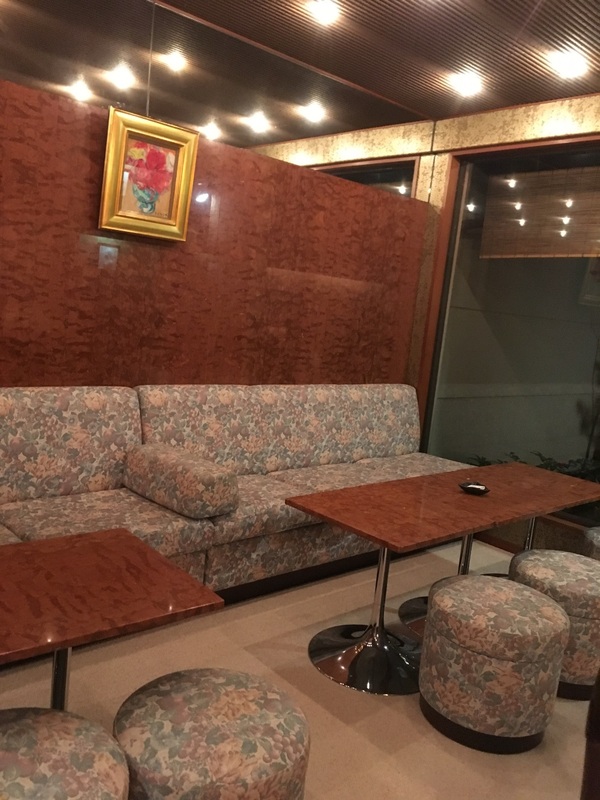 Faded pastel coloured floral patterns on sofa covers, little creaks of wooden floorboards and a bar counter that’s wiped down many times over with a humble cloth, are nothing to shout about. Typically, an Ochaya caters to a discreet clientele with expensive taste. Yet, the teahouse is modestly decorated. The interiors are nothing to shout about. The Ochaya simply provides a safe and welcoming space for entertainment. We are given their full attention. A few quintessential Japanese bar snacks are served. Carefully roasted groundnuts, fish shaped crackers, criss cut fuji apple slices, cute cans of soda and a curated selection of gin, rum and whisky are plated in vintage crockery. A 2.5 hour meeting with Maiko easily sets me back by ¥70,000. Besides the physical, the intangible hospitality and privacy all come together to provide pleasure and luxury. At the Ochaya, patrons are given full attention. 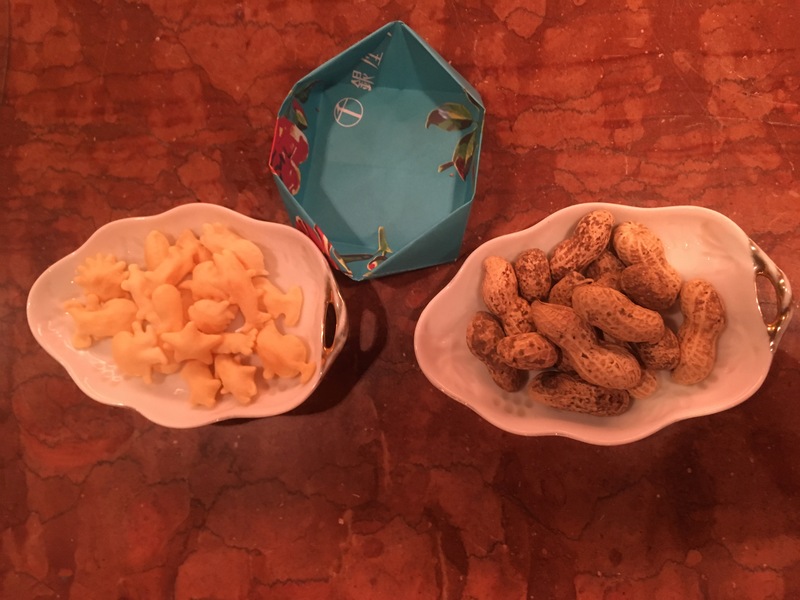 We are served a few quintessential Japanese bar snacks plated in vintage crockery. This Maiko is very petite. At 19 years old, she possesses a kind of certainty and confidence rarely seen in a late teen. Meeting Maiko is one of the most exclusive travel experiences Kyoto has to offer. The illusion of grandeur and exclusivity is heightened when Maiko arrives. 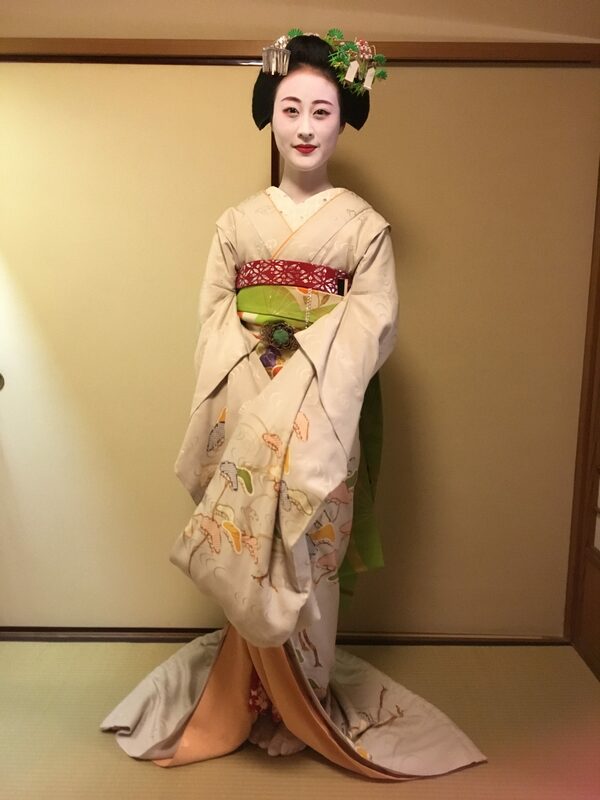 Donning an elaborate hairdo, white makeup and an exquisite kimono, this young woman of dance is very petite. At 19 years old, she possesses a kind of certainty and confidence rarely seen in a late teen. Maiko walks with an air of congeniality. As a professional entertainer, her demeanour is trained to embody subtlety and grace. It is evident that she is taught to comport herself. 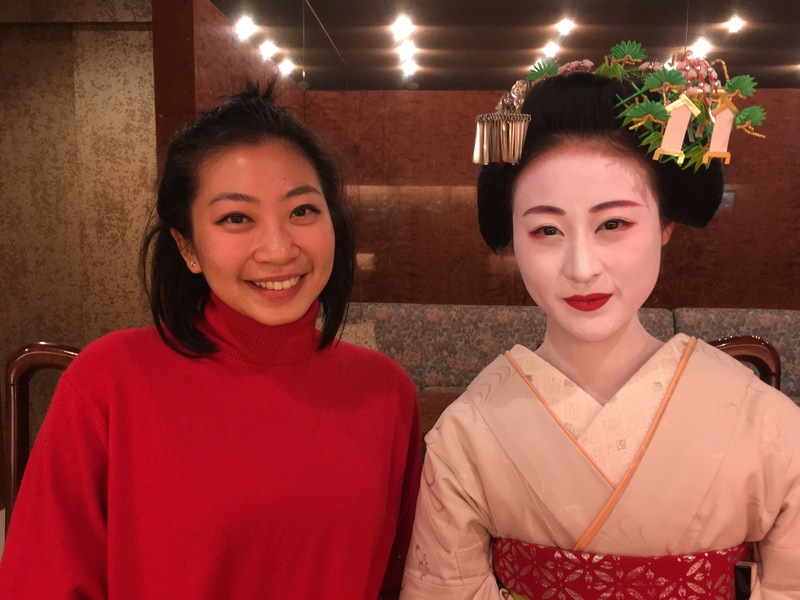 As I pull off my winter coat to reveal finer threads, Maiko compliments the bright red turtleneck, which matched her crimson lips set against a powdered face of allure. Now and then, Maiko takes cues from Okaasan, who is adept at hosting. We exchange pleasantries. It helped that my dress was a rare collaboration between the ubiquitous Japanese retail giant Uniqlo and earnest British label JW Anderson. Soon, we were in conversation about fashion, travel and makeup. My bright red turtleneck, a rare collaboration between the ubiquitous Japanese retail giant Uniqlo and earnest British label JW Anderson, matched Maiko’s crimson lips set against a powdered face of allure. As Japan’s most iconic cultural symbol, Maikos undergo at least five rigourous years of training. Her apprenticeship consists of learning songs, dances, traditional Japanese instruments and games. Unlike typical Japanese women, Maikos exist in a different world. In the day, she dedicates herself to polishing her musical performances. By night, she goes out to work. Sometimes, she travels abroad. Maikos do not pursue an education, a good career and stable husband. As such, carving a niche in the artistic world of the Geisha comes at the expense of love. This is a profession that guarantees independence and self-sufficiency in a largely homogenized society. From 15 years of age, Maiko is on a mission to preserve time-honoured traditions. Did you have a love interest? I quizzed. Maiko keeps a stiff upper lip. Yes, but she was jilted by her high school crush. For Japanese teenagers, Valentine’s Day is that time of year for confessions. Token chocolate boxes, which signify a piece of the girl’s affection, are gingerly presented to the boy. It is a big move for 14 year olds, a gesture which cannot be taken lightly. Alas, Maiko was rejected. Summoned home, she ate the chocolates, and wallowed in sorrow. On her way to becoming a full-fledged Geisha at 20, Maiko is well aware that she could not marry in future. I probed further by asking Maiko if she likes children. Don’t you want them? I nudged. Maiko winced, admitting that this is difficult to answer. Before becoming a Geisha, Maiko wanted to teach in a kindergarten. With a soft spot for toddlers, not wanting some of her own is an issue Maiko is still trying to grapple with. Like many women in Asia, Maiko’s dilemma stems from social pressures to marry and have children by a certain age. But finding the right man is not easy in stoic Japan. It is no wonder an increasing number of teenage girls find solace in becoming a Geisha. When the opportunity to be self-reliant presents itself, gaining independence in a high culture world becomes a practical alternative. As we bid adieu, I walked into the chilly night, exhilarated. In the heart of Japanese heritage, I instantly fall for Kyoto. This is a city that preserves the historical details in everyday life. Without overindulging, it is beautiful to marvel at how traditions and modernity can coexist. Meeting Maiko had opened my eyes to a Japanese part of women and society. Passing through the stretch of private properties built in styles unique to Kyoto, I am grateful to have met the dauntless doyenne of the Orient.